“We don't have enough staff to work the gardens in every school, so we've started recruiting and training volunteers,” said Lisa Paniagua, school garden sustainability coordinator for the UC Garden Nutrition Extender program in San Luis Obispo and Santa Barbara counties. The Sunshine Garden is a section of the UC Master Gardener demonstration garden adjacent to the UC Cooperative Extension parking lot in San Luis Obispo. It is a model garden that can be replicated at local schools and is used for training the Garden Nutrition Extender volunteers. 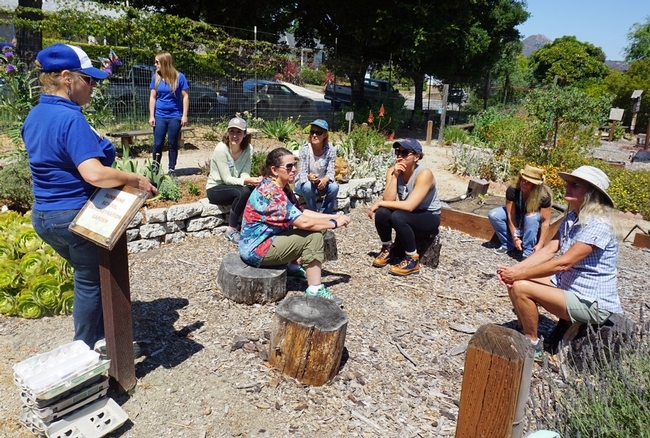 “By enlisting passionate volunteers, nutrition educators could significantly multiply the number of students who had access to school gardens, nutrition education, and training in science, technology, engineering, and math (STEM) in the garden,” said Katherine Soule, Ph.D., youth, families, and communities advisor in San Luis Obispo and Santa Barbara counties. Klisch said UC Garden Nutrition Extenders are local members of their school communities. “They are often parents, neighbors or staff and they have a personal investment in seeing the youth and the school environment flourish, which makes for a much more sustainable intervention and increases community capacity to sustain a garden program," she said. 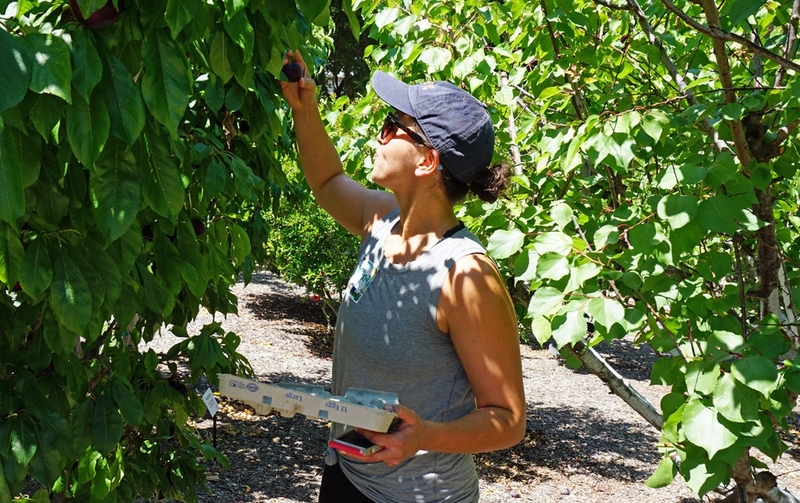 Paniagua, Klisch, and Soule created a hybrid training program integrating volunteers and educators from UC CalFresh, UC Master Food Preservers, UC Master Gardeners and 4-H. They selected a 4-H gardening and nutrition curriculum written by researchers at Texas A&M AgriLife Extension, which includes engaging, student-centered, experiential learning while dividing time between the garden and the classroom. The curriculum reinforces goals in Common Core and Next Generation Science Standards, policies that guide public school teaching. “Teachers will want to know we are familiar with curriculum standards. Applying them adds value to these classes,” Paniagua said. Trainees set out to collect garden items in a scavenger hunt. In July, the third cohort of future UC Garden Nutrition Extender volunteers gathered at UC Cooperative Extension in San Luis Obispo to learn how they can help schools transform their gardens into fruitful learning activity centers for the students. 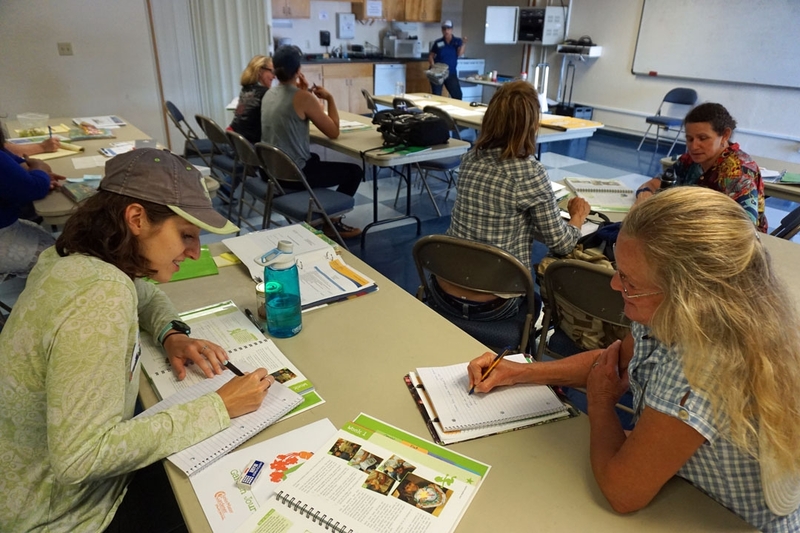 One member of the new cohort is Jill Marie, a certified Master Gardener in San Luis Obispo County. 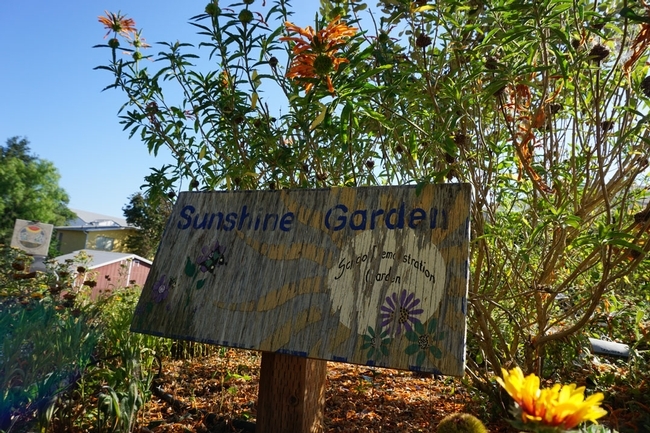 “I live by a school and they have garden beds that are not kept up. I want to get involved and get to know the kids,” she said. The volunteer teachers learn by conducting the indoor and outdoor curriculum activities and food demonstrations over a four-week period. 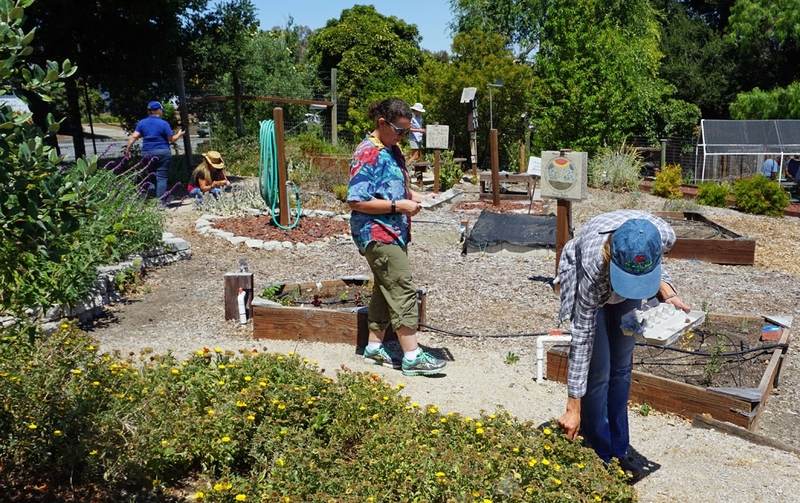 Their first foray into the UCCE Sunshine School Demonstration Garden began with a mindfulness practice. Christina Lawson, director of nutrition at Coast Unified School District, finds 'something round' in the garden. 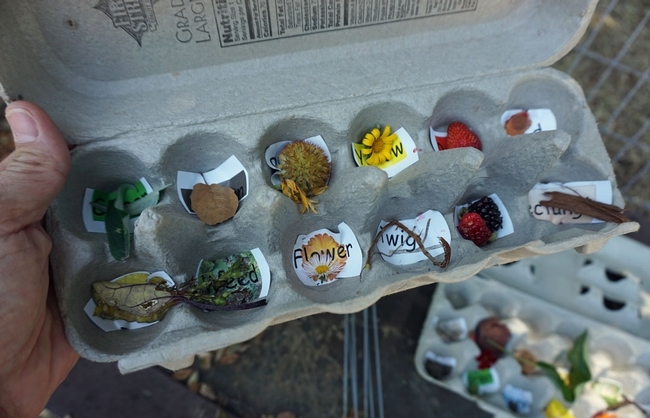 To encourage students to take a closer look at the garden, the class was sent out with egg cartons labeled for a 12-item scavenger hunt, and later asked to select one item to discuss. Reporting on topics are part of Common Core standards for students in third- through fifth-grades and creates discussion learning topics around science, math, engineering, art, and even poetry. The practice involved finding something yellow, red, green, brown, round and rectangle shaped. They collected leaves, twigs, flowers, seeds, weeds and edible items. 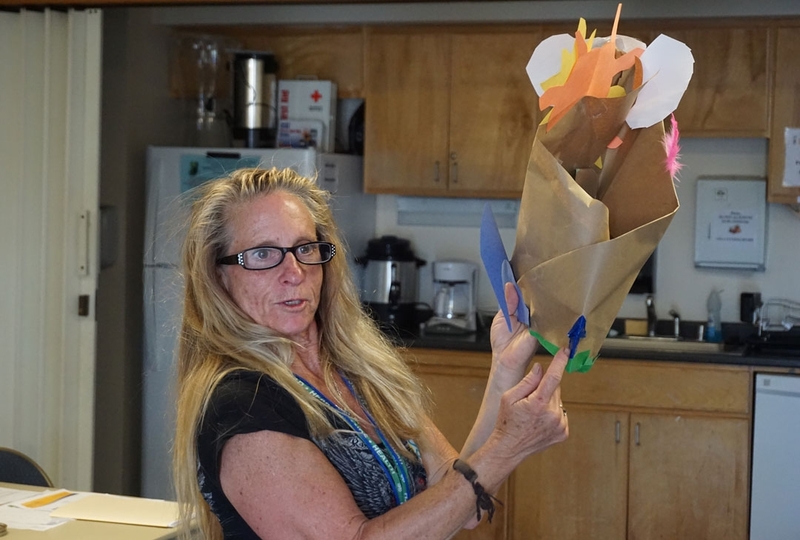 Back in the classroom, the trainees began work in pairs on the next lesson, “Know & Show Sombrero.” With paper, tape and a bag of craft supplies – balloons, ribbons, foam stickers and construction paper – the extenders made hats that represent everything a plant needs. One group used a yellow balloon to symbolize the sun, another had water drops raining down from the brim. A third group sprinkled glitter to represent the nutrients in the soil. 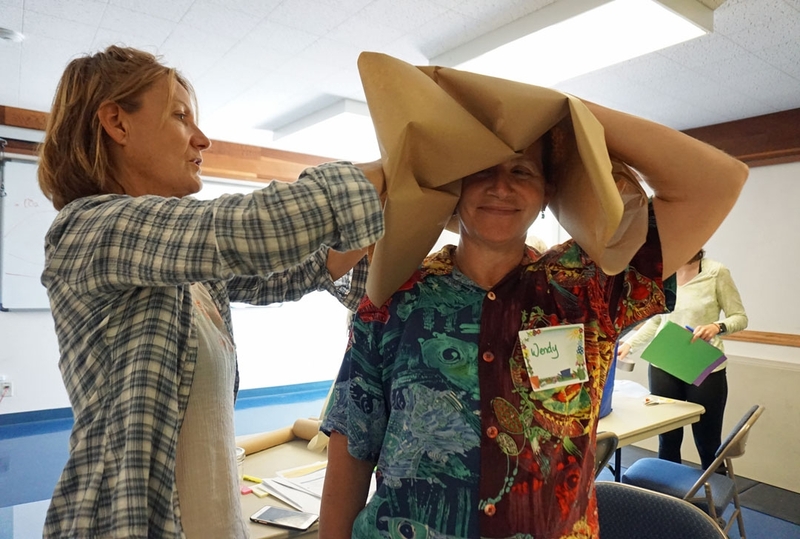 Farmer Carla Rosin, left, and nursery professional Wendy Minarik form a paper hat. The half-day session ended with a tasting of purple, yellow and orange carrots. “In your journals, write words to describe the smell, sight, taste and feel of the three colors of carrots,” Paniagua said. One of the volunteers Christina Lawson, director of nutrition for Coast Unified School District, laughed. This project is funded through local grant awards from the National 4-H Council in collaboration with Lockheed Martin, and UC CalFresh Nutrition Education Program, which is a joint agreement among the U.S. Department of Agriculture/Food and Nutrition Service (USDA/FNS), the California Department of Social Services (CDSS) CalFresh branch, and the University of California Cooperative Extension (UCCE). Extender trainee Stacy Henderson explains the symbols on her paper hat. Working in groups of two. In the front are CalPoly master's nutrition student Alyssa Friebert, left, and UC Master Gardener Jill Marie. I recently attended the National Children and Youth Garden Symposium. How do I obtain the 4H gardening and nutrition curriculum from Texas A&M Agro-Life extension? I am a Master Gardener and Master Food Preserver and I am the director of school gardens for Modesto Garden Club. I work with 25 schools in the Modesto area.